At Capital City Curb and Gutter, we offer the most affordable and highest quality custom outdoor fire pits. Our experienced and professional team will install a beautiful fire pit on your deck, patio, or garden that you can enjoy all year round. We’ve been constructing outdoor fire pits in the North Carolina, South Carolina, and Virginia areas for years. We’d like to add you to our growing list of satisfied customers. Let us design, build, and install a fire pit to match your decor needs today. Imagine sitting around outside, all warm and cozy around a relaxing fire. After all, what better way to spruce up your deck, patio, or garden than your very own custom outdoor fire pit? It’s the perfect place to gather outdoors with friends and family all year round. Whether you’re looking for gas or wood burning, we’ve got you’ve covered. Furthermore, we can fully customize your new outdoor fire pit to perfectly match your needs and specifications. Many different colors and styles are available. We can even build you your own custom outdoor fire pit that will perfectly compliment the look and feel of your home’s decor. Our team will handle it all – the design and installation is fully taken care of. All you need to do is relax and enjoy this lovely new addition to your outdoor area. It will improve the value of your home, and give you a place to unwind and enjoy the great outdoors, even on cold nights! 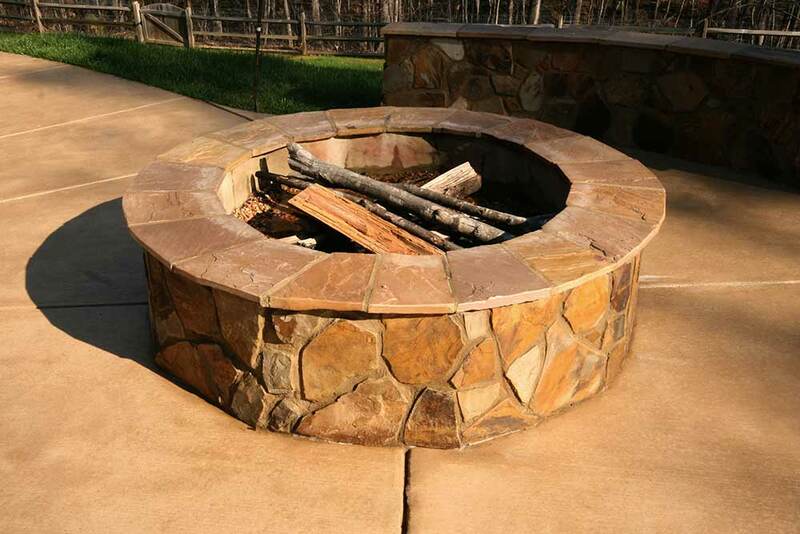 Capital City Curb and Gutter, located in Wake Forest NC, has been serving the North Carolina, South Carolina, and Virginia areas with all of their outdoor fire pit needs for years. If you need an estimate on your very own outdoor fire pit, please contact us right now. It doesn’t matter how big or small your project is. Our knowledgeable and reliable team of designers and installers is standing by, waiting to answer all your questions. Put our experience and expertise building custom outdoor fire pits to work for you. Call us at 919-876-5155 or contact us online for more information about our design and installation services.